»Audio »The Perfect Event Activation for the Essence Festival! At In Depth Events, we work with marketing firms all over the world to help promote their clients brands. Our clients range from sports marketing firms to guerrilla marketing firms – and everything in between! Our marketing firm clients promote cutting edge products and we are here to make the technical production side of their event activation work flawlessly. For the last two years, the founders of In Depth Events worked with one of the most respected marketing companies in the world on a very specific live activation. The Marketing Arm needed a an event production partner to create an event activation at the Essence Festival. This annual event in New Orleans was started to support Essence magazine and is “The Party with a Purpose” for African-American women from all over the United States. The end client in this event space used our signature LED Dance Floor as a centerpiece to the activation. Paired with the eye-catching floor is a custom built DJ booth with LED lighting on the front and sides as well. 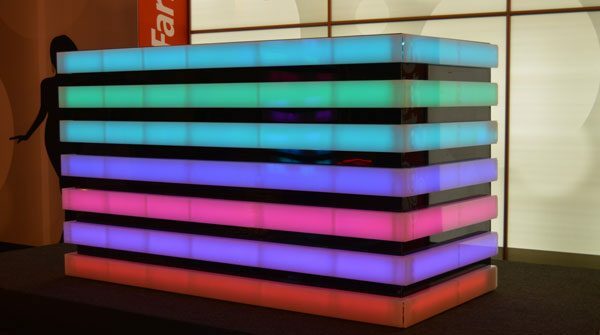 This dynamic look blends perfectly with the other set pieces in the event activation and provides a virtual magnet to get people into the booth and boogie down on the LED Dance Floor – all while getting eyes and impressions on the client logo and branding! The Essence Festival is certainly not our largest activation. However, it offers a highlight to one of our fun, niche products that included some custom work as well. This activation remains one of our favorites because of the great companies we get to work with, the fun atmosphere of the activation and the seamless way that all the elements come together to promote the client brand. Are you interested in finding out how In Depth Events can help your clients brand? Ask Us a Question today and let us know how we can bring your activation ideas to life! Robert Chapman is a father, business developer, event professional, musician, and writer. Out of all the writing Robert has done, his favorite are the Event Planner Guides, which have been read and downloaded by tens of thousands of event professionals.